HBO has announced its "Deadwood" sequel movie will premiere on the network on May 31. "Former rivalries are reignited, alliances are tested and old wounds are reopened, as all are left to navigate the inevitable changes that modernity and time have wrought," said a synopsis that accompanied Thursday's minute-long teaser on YouTube. "Deadwood: The Movie" was announced in July. The film follows a 19th century-set western drama series that wrapped in 2006 after three seasons. It starred Ian McShane, Timothy Olyphant, Molly Parker, Kim Dickens, John Hawkes, Robin Weigert, Dayton Callie, Paula Malcomson and Brad Dourif, most of whom returned for the sequel film and are shown in the preview. 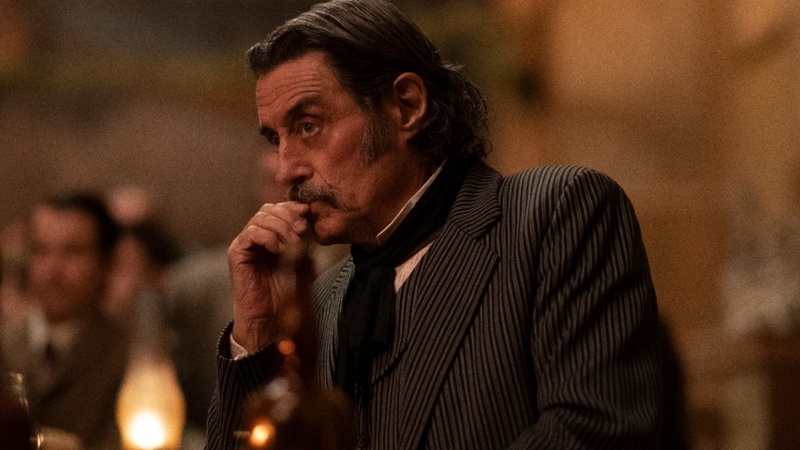 "This town is a sanctuary," McShane's saloon owner Al Swearengen is heard saying in the clip as the camera moves through his South Dakota town. "Every man worth a name knows the value of being unreachable." Swearengen is also seen speaking with Olyphant's Sheriff Seth Bullock in a tavern. "You ever think, Bullock, of not going straight at a thing?" Swearengen asks.